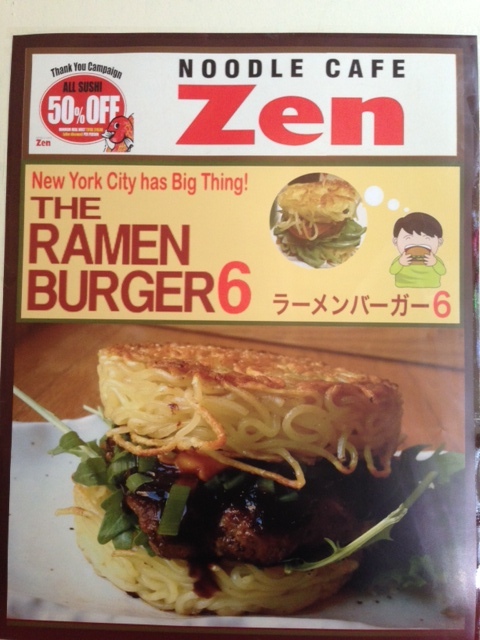 I had heard about “The Ramen Burger” as New York City’s next big food craze for awhile now and finally had the chance to try it this past weekend. My friend and I were wandering around St. Mark’s Place in search of a good Japanese restaurant. We finally came across Noodle Cafe Zen (my find! ), where they were having 50% all sushi and a delicious looking lunch special. I was all set to order the salmon teriyaki until I saw the sign for The Ramen Burger. Total game changer and we both ended up getting it. It took awhile for the food to come, but it was well worth the wait. 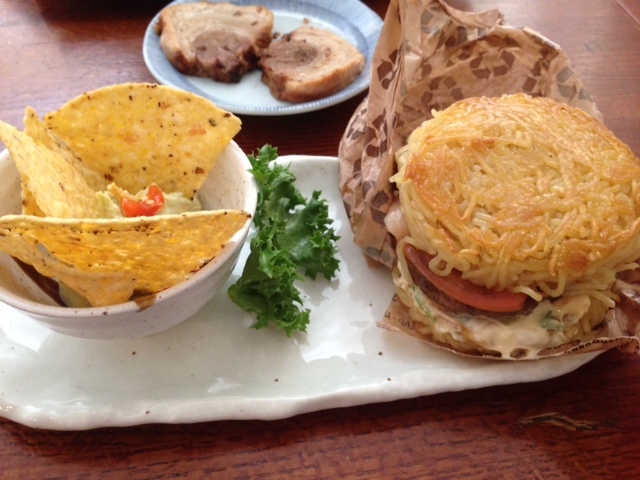 The Ramen Burger came with tortilla chips and a light green hummus-y dip. I thought the tortilla chips were cute, if a bit unorthodox in a Japanese restaurant. Though, it did look like the main chef was Mexican so he probably just wanted to add a bit of that flavor into the meal. We also tried a side of charsiu pork, which was way too fatty for me. I am used to the Chinese version which is bright red, lean BBQ pork so could not fully enjoy the Japanese version of the pork. 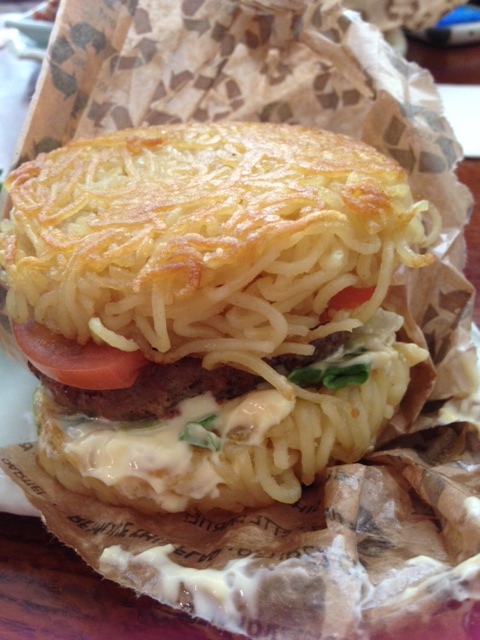 I did, however thoroughly relished The Ramen Burger. The ramen itself was fried and the meat patty was a blend of beef and pork. The meat was incredibly juicy, savory, flavorful and delicious. There was also tomato, green onion, Asian mayonnaise and a sweet dark brown sauce that worked well together. It was pretty messy, but definitely worth it to try to get a bit of everything in one bite. It was also very filling and satisfying. I’m glad I had a chance to try this food creation and I would even come back to the restaurant to try other menu items, such as the shrimp tempura roll, salmon teriyaki, chicken katsu and ginger ice cream. (I was all set to order the ginger ice cream while I was there this weekend, but sadly they were out of it!) 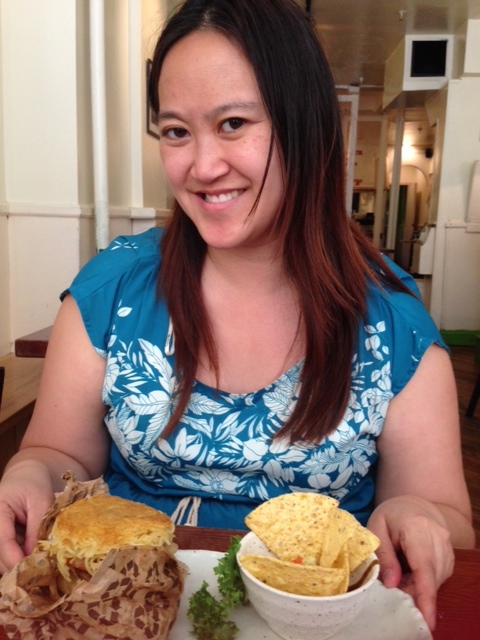 Overall, great experience, tasty food and excellent service.